I’ve called St. Gallen home for the past few months, but my short time living in Switzerland has now come to an end. It is surprising how quickly a place can feel like “home.” The upcoming move has really gotten me thinking about what “home” really means, especially since I have been moving around so much in this past year and will continue to do so… well, indefinitely, I guess. I was the guest host on the Chicken ‘n’ Waffles podcast over at Leena Eats a few months back. The topic was living and eating abroad, and in preparing for the taping I put some major thought into my mobile lifestyle. Cooking is obviously a priority in my life, but when you move so frequently (and are constantly on a tight budget) it is nearly impossible to maintain a stocked kitchen – so here in Switzerland, my pantry has salt, pepper, dried pepper flakes, saffron, a few boxes of various carbs at any given time, instant coffee… and that’s about it. I have a pan, and two pots, a few wooden spoons, a box grater, a kitchen knife, two forks, and some other basics. No microwave or electronic appliances. And you know what? I love it. It is liberating. I’ve realized over the past year that I don’t need fancy equipment or a gas stove to make great food (although, I must admit, they would often help). I’ve come to think that home is a place where you are comfortable, where good, albeit simple, food is lovingly originated and is enjoyed with gusto. And my little apartment on Zürcherstrasse has met that criteria over the past three months. When we first arrived, the winter atmosphere that I hadn’t experienced in Australia prompted me to immediately think back to homey American comfort classics. Think butternut squash lasagna, chicken pot pie, potato-based casseroles, vegetable stews. I went as far as having a weeklong run where I solely cooked American classics. That’s very unusual for me, as my weekly menus are usually pulled from around the globe. One evening I found myself with a random assortment of chicken breasts, bell peppers, mushrooms, and some cream. Normally I would pull out some sort of pasta in cream sauce with that combo, but I was feeling saucy (pun intended) and my pile of ingredients stirred a memory in the far recesses of my brain – of chicken à la king! I did some research on the dish and discovered that the cream sauce bathing the chicken and vegetables is thickened with flour and enriched with egg yolks. Rich, no doubt. Outdated, certainly. A project for a bored gal living in Switzerland? Most definitely. I can’t really say that my chicken à la king transported me back to my childhood with loving memories of mom schlopping thick eggy cream sauce on plain white rice. In fact, I’d never actually eat chicken à la king before (but I had seen it re-created on Top Chef). And, um, well, I’ve also never eaten invalid food in an old persons’ home, but for some reason, that’s what this dish reminded me of. I won’t be making it again. Stick with the pasta in cream sauce, folks. Also attempted during my run of American classics was gumbo. Phil worked at a restaurant in Jacksonville where gumbo was the house specialty. I’d never made it before, but truth be told, most of the stuff I make is a first time experiment and Phil is always happy to oblige. He was my gumbo consultant – picking out the okra, which I’d never cooked with before, and instructing me to let the roux brown way past the point of rational comfort. Seafood isn’t exactly overflowing in the markets here in German Switzerland, so I decided to go with a chicken and sausage gumbo. Sausage IS overflowing the markets, and the food carts, and the supermarkets, and the restaurants here. This part of the country was built on sausage. I digress. The gumbo was just, well, just okay. I put plenty of love into it but making gumbo in Switzerland is kind of like going skiing in Australia. You can do it, but it just doesn’t seem appropriate, somehow. But darn, that roux was a beautiful chocolate brown! My cooking escapades gradually took a European spin. Pappardelle with veal, beef and pork ragù? Great success. The wide noodles carry the chunky richness of the sauce and the parmigiano didn’t really have to travel THAT far from its home in Emilia-Romagna to show up on my plate. My snacks were undeniably Swiss from the beginning of my time in this part of the world. Chestnuts are roasting all over town this time of year and make a cheap, convenient snack. But they are way above the cheap convenience of other snacks – their warm, creamy, nuttiness beats a bag of chips any day. Actually, sometimes you just want chips, you know? I bought these special edition guys because I liked the faded, fake antique photo of a laid back pig-tailed Swiss gal hanging in the Alps, eating potato chips with perfectly distributed pepper granules from the stump of a tree trunk. A true Swiss scene. They turned out to be uniquely flavored, perhaps owing to the Swiss alpine salt and peppered fresh cheese? Hmm. I’ve actually found out that you can learn a lot about a country’s flavor preferences by browsing the potato chip section of the local supermarket. My Australian roommate Madi loved Thai sweet chili potato chips dipped in sour cream – the quick version of potato wedges with sweet chili sauce and sour cream. Australia also has chicken-flavored potato chips and I am sorry but that is just silly. I remember seeing the craziest flavor combinations in Japan but I liked the nori-flavored and the spicy wasabi chips. 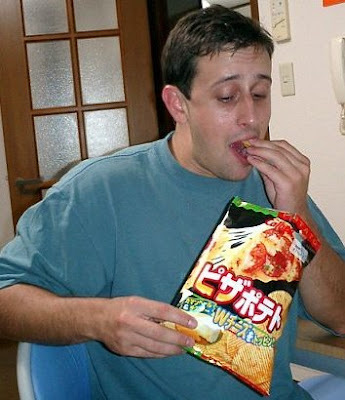 Here is Phil enjoying what is clearly a pizza-flavored variety in Japan. This was about the closest we got to comfort food there. Gosh now that I think about it, I really love potato chips! I had kimchi ones in Korea that were odd. But I must say that my favorite is hands down the Cape Cod sea salt and vinegar potato chips that are available in the U.S. They’re kettle-cooked, and I’m not sure what that means, but I am sure that they are the crunchiest, curliest, saltiest and vinegariest chips I’ve ever tried. If you’re bored, I just realized that the wiki entry on potato chips is fascinating. Canada has its dill pickle or poutine-flavored potato chips, Japan has a scallop and butter variety that I (thankfully) never came across, cucumber-flavored chips are available in China, masala or coriander in India, chile y limón in Mexico, oregano in Greece, mayonnaise and lemon in Columbia… and Germany of course has a beer-flavored variety! But the UK dominates the contest with such awesome options as Marmite, Worcestershire sauce, lamb & mint, roast pork and creamy mustard, lamb with Moroccan spices, buffalo mozzarella with tomato and basil --!!! I know where I’m going to move if I ever want to be a fake flavor taste tester! Jeez that was an unexpected tangent, maybe I should write an article on discovering world cuisines through the humble potato chip. Back to wrapping up my time in St. Gallen…. Just this week I embarked on my most ambitious Swiss-food making mission yet. I picked up a cookbook on Swiss specialties and tried to translate it from German to English, to varying degrees of success. At first, I thought my Härdöpfel-Pizokel was going to be a disaster. But, thank goodness for the instructional photos accompanying the recipes! The version of pizokel in my cookbook is essentially a mound of potato dumplings smothered in Gruyere, onions, and bacon. You first peel and grate a heck of a lot of potatoes and mix them with flour and salt, then make potato balls which you boil until they float. My first few tater balls fell apart in the water and I had to continue adding flour to the mix until they held their shape. But eventually I had a pile of boiled carb-balls in my baking dish that I covered with a blanket of grated Gruyere and baked for about 20 minutes. As they were baking, I fried up some cubed bacon and onions to top the dish. Pizokel will definitely make plenty of appearances on my table in the future as a substitute for scalloped or roasted potatoes. 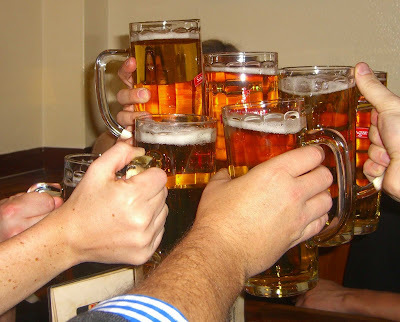 Goodbye massive mugs of beer. The next few weeks I will be heading SOUTH through Italy. Watch for posts at the beginning of April on time spent in Lugano, Como, Milano, Venezia, Firenze, and Roma. Cuisine of the southern United States gets a bad rap. As you discerned, it's easy to make Gumbo but hard to make good Gumbo. The same goes for hush puppies, collard greens, sweet tea and Bar-B-Q. Or any number of other southern delicacies. I have no doubt that once you spend a little time in the south you will master the intracacies of these dishes just like you did the international cuisine we have been reading about lo these many months. PS- Have fun with my Mom. She is a pretty fun travel companion. Great post Cari, haven't peaked through what you've been chomping on lately and that really brought me up to speed gf! Can't believe that the its already March and your travelling through Italy now, feels like only yesterday we were talking about you leaving and trapising around Europe with Phil and his mum! Wow! Love you lots and can't wait to see/ hear more of your food journeys.